MBABANE, Dec 30 2011 (IPS) - While the Swazi economy is teetering on the brink of collapse, the government is banking on the future by providing funds to help young people set up businesses. After realising that the country is failing to attract adequate foreign direct investment, last year the government established the Youth Empowerment Fund (YEF) to give seed money to young unemployed people to start businesses. “Young people constitute more than half of the unemployed and government was trying to get them off the streets while they put bread on the table,” said director of youth affairs Bheki Thwala. Although the government was already facing a severe fiscal strain following the 60 percent drop in revenue from the Southern African Customs Union (SACU), which used to finance more than 60 percent of the Swazi budget until changes to the bloc’s revenue formula, it did put aside some 1.250 million dollars for the youth fund. Loans from the fund carry a 10 percent interest rate, while no collateral is required from the beneficiaries, who are between the ages of 18 and 35. “It’s a development fund aimed at addressing unemployment among the youth,” said Thwala. Futhi Mngomezulu, 29, and her 27-year-old sister Gcebile are among a group of close to 600 young entrepreneurs who have received loans from the government to start a business. Futhi is a qualified IT specialist while Gcebile is an electrician. But neither could find employment in their areas of expertise. As a result, they decided to start a company that specialises in designing and making emblems for school uniforms. Fortunately, a year later, the government invited applications from young people hoping to establish businesses. The two sisters are taking schools in the capital city and surrounding areas by storm, offering designing and embroidery services. 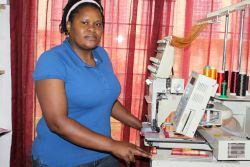 Their company, FGM Embroidery Services, received some 6,200 dollars from YEF, which they used to buy the embroidery machine from South Africa. “We responded to the high demand for these services after realising that there were only two companies providing them,” said Futhi, adding that the market was overwhelming for the existing suppliers. Before receiving the money from the organisation that has partnered with the government to disburse the funds, Imbita Women’s Finance Trust (IWFT), they were trained in entrepreneurship and business management. “We know how to keep our books, and the basics of running a business,” said Futhi. Although the orders keep coming, being young meant that they had to work hard to convince the clientele that they could deliver, operating in an industry where deadlines can either make or break you. Engaging an agency like IWFT to administer the fund has been a great success, said Thwala. IWFT is tasked with screening the applicants, disbursing the funds, and monitoring and evaluating their performance. This year only 152 people benefited from a total of 250,000 dollars because the ministry did not have a budget for the fund as government hit rock bottom, struggling to pay salaries, supplies and social grants or cash transfers. An individual beneficiary is entitled to receive between 63 and 2,475 dollars; a company gets between 630 and 6,200 dollars; while an association receives a maximum of 12,500 dollars. The training, coupled with a great deal of enthusiasm and hard work, has gone a long way towards securing a higher repayment rate, said IWFT director Sibongile Shongwe, although the challenge is ensuring the growth of the enterprises. “Young people have a vision in business, but it takes a lot of nurturing and forward planning to take an enterprise to a higher level,” said Shongwe. However, the biggest challenge in running YEF is that some beneficiaries are not truly interested in becoming businesspeople, but are merely unemployed. As soon as a job opportunity knocks on their door, some beneficiaries abandon their projects. Others in the meantime have pursued their education outside the country after getting scholarships, leaving their businesses hanging. As a result, the government is working on a policy to try and bring defaulters to book because, she said, this is supposed to be a revolving fund so that more people can benefit from it. However, in cases where the projects are hit by natural disasters like a storm, IWFT, after carrying out an evaluation, does offer refinancing to get the business back on track. “We also advise projects that are susceptible to natural disasters, such as gardens and breeding chickens, to take insurance,” said Shongwe. She said there are many success stories like Futhi’s where young people are working hard to make their businesses go. Although it’s still early days for Futhi to start counting the profits, the young entrepreneur said the business is on the right track.